Dirty Martini Queen's Musings: Stop the insanity! Wow, time is just flying by so fast and we're now less than a month until the official move. I've been meeting with movers, selling furniture on Craig's List, dealing with renters insurance quotes, seeing dr's and basically just losing my mind! Oh well such is life and it's not like I haven't been to this rodeo many times before. I think this time it's just that I'm not working so there is nothing to keep me distracted from stressing about the move. I didn't even stress this much about the move to Germany so go figure. Anywhoo, I mentioned that I've been selling furniture but I forgot to mention that I've also been buying furniture. What???? 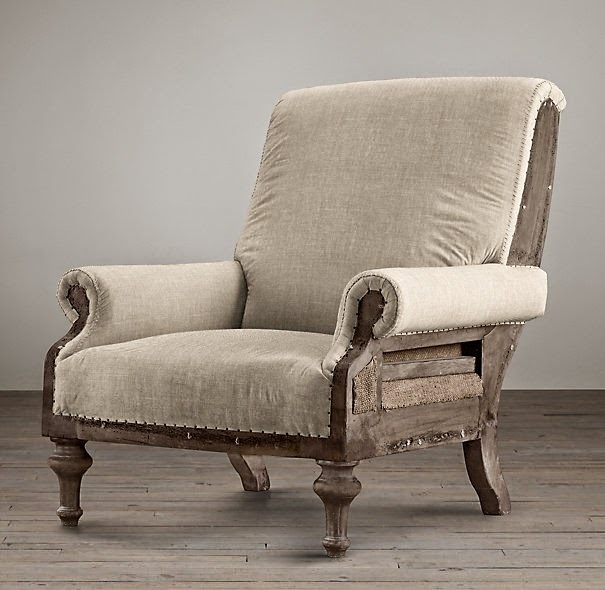 I found the most perfect chair at Restoration Hardware outlet store and I just had to have it. It's the perfect size so I can actually touch the floor which is amazing for short people like me. It just called out to me and said it would become my favorite stitching chair so how could I walk away from it. Well actually, I did walk away but took Mark back to look at it the next day. I was so worried that it would be gone because it was 40% off retail and they had a coupon special of $25 off for every $100 spent so it was a bargain that shouldn't be passed up. LOL! Mark agreed so we brought her home with us and just look at this amazing chair. Just makes me swoon!!!!! It's a deconstructed look so you see the wormy, worn wood frame, the burlap under layer, whipped stitching and just looks 100 years old. Love it! We're headed back to Atlanta on Thursday and I've got people coming to buy our living room and theater furniture. We're only keeping the den Pottery Barn CL loveseat, Mark's old leather chair and now my new chair. See I told y'all I was downsizing! We sold the pinball machines last week and I also sold a couple small tables that I had stashed away. Now the sofas, chairs and hopefully all the tvs will be gone by this time next week. We have several flat screens that require cable boxes so we figured if we sold all of those then we could get a new tv that doesn't need a box for the bedroom. We're keeping the great tv from the den because it's just so amazing that we can't bear to part with it. It's been fun listing stuff and it's really fun when people hand me cash and leave the house with the items. It would cost me more to move and store this extra furniture than it will be to buy new stuff when we find our forever home! 2) There are too many ways that stuff could get "lost"
Well that's about it for now friends 'cause I need to head to the city admin building to get the utilities changed over and start the post office process of changing our address. Hope y'all have a great week and a very Happy Easter! Good for you two! Whew, it sure is busy, isn't it?! A Blessed Easter to you! Happy for you and your adventures. Buying and selling is so much fun. You will enjoy your new home and I may be prejudiced but Tn is a wonderful place to be. Hey Donna, oh I love love the chair, great for you....hope your settling in your new home, Tennese sounds wonderful. Happy Easter to you and yours, Hugs Francine. That is a very cool chair.